Fish passes also called as fishways or channels or series of pools installed to aid fish in overcoming natural or artificial obstacles to migration. In other words fish pass structures are the structures through which all kinds of fish can move throughout the year. While constructing a fish pass over a river, a small amount of water is diverted from the river to upstream of the obstacle (dam). The diverted water flow is controlled throughout the length of the fish pass by means of baffles, weirs or orifices to reduce water velocities to the point where the fish migrating upstream can swim without too much exertion. There are some rest areas within the fish passage (pools) in which the migrating fish can restore energy. There should be optimal condition of light for clear visibility for the moving fishes. 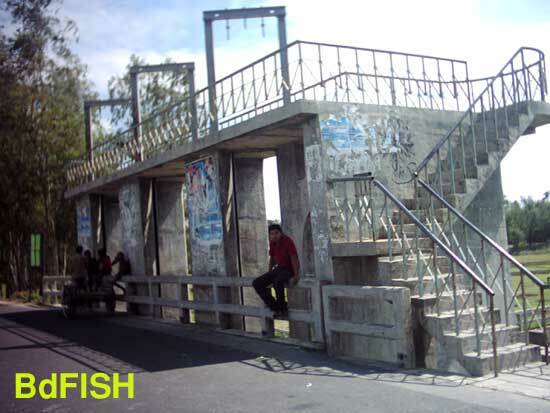 Kashimpur fish pass structure (24 May, 1995) was installed for revival of the old status of the Kawadighi haor where a construction of Manu River Project (MRP) in Maulavibazar has ruined the mother fishery the structure is situated between the Kushiara river and Kawadighi haor. 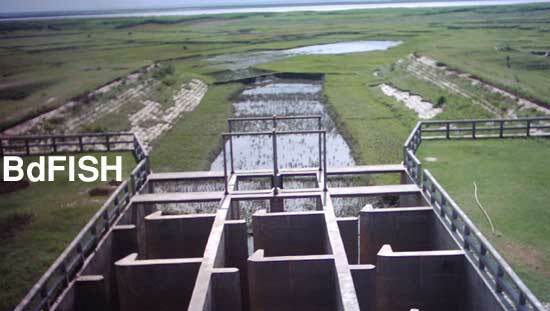 Jugini Main Inlet under the Compartmental Pilot Project (CPP) at Tangail (FAP, 20, 1994). The main regulator in a fish friendly structure is constructed in the Lohajang river (1996). 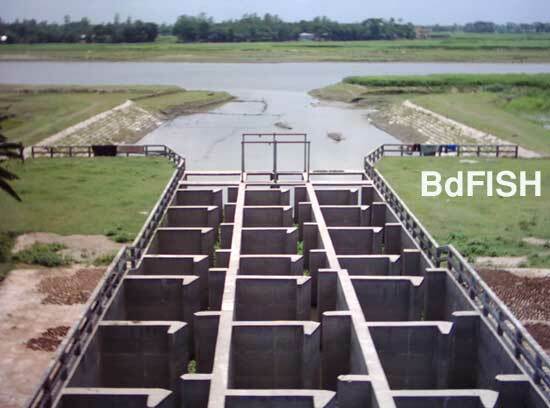 Marichar Dangra regulator in Chapai Nawabgonj district, which acts as a fish passage with regulator. It is located at the western end of Marichar Dangra canal at the confluence with the Mahananda river. 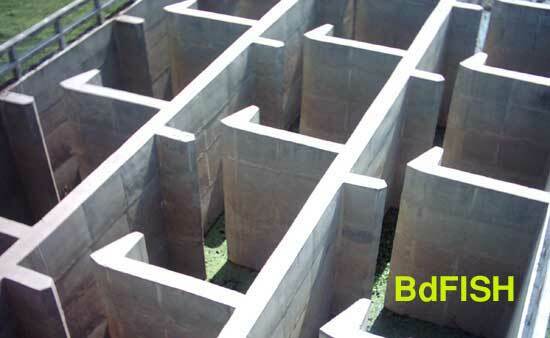 It is constructed by BWDB (Bangladesh Water Development Board). Sariakandi fish pass on the Jamuna to the Bangali river in Bogra (1999-2001). This is the most recent one and modern fish pass of Bangladesh. The structure is a Flood Control and Drainage (FCD) established for the prevention of river bank erosion. The construction of Brahmaputra (Jamuna) Right Embankment (BRE) in the late 1960s, affected the flooding pattern and fish production in the Bangali river. Which had directly affected livelihood the adjacent fishers’ community. To overcome the effects, the later structure was built. The Sariakandi fish pass is the most recent and largest one; which is constructed and owned by Bangladesh Water Development Board (BWDB). Construction of a 6 km embankment to join the Kalitola Groyne with the river bank protection works at Mathurapara, which included the fish pass facility. It is rectangular in shape. Total length of the structure is 92.4 m and width is 15 m.
There are 3 separate and parallel passages. There are 3 vents (with gate) and 16 pools in each vent. The design is vertical slot type. 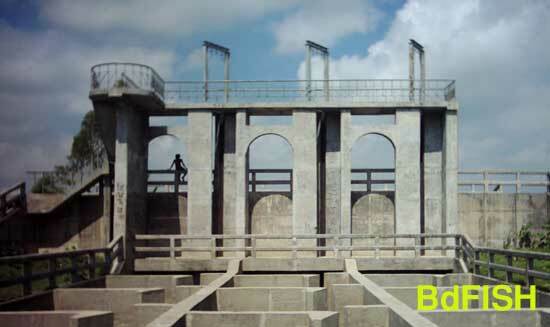 Pool: length 4.8 m, width 4.2 m.
Water flow velocity of the middle and two sides of the fish pass, both from upstream (the Jamuna river) and downstream (the Bangali river) were recorded (BWDB, Bogra). Table: Water velocity at Sariakandi fish pass. During both upstream and downstream movements the major carps passes the fish pass through either side of the passage. That means the flow velocity these prefer in ranged between 0.107 to 0.111 m/sec during upstream migration, and from 0.206 to 0.214 m/sec during downstream movement. The species like chital, Batasi and catfishes preferred the middle section of the pass where the water velocity ranged from 0.056 m/sec (upstream migration) to 0.130 m/sec (downstream drifting). The spawns and hatchlings were found to drift through the middle part of the pass where the flow velocity is 0.130 m/sec. After construction of the fish pass, the water volume of the Bangali river is increased. There is a increase of fish diversity and fish biomass, resulting is an improved livelihood of the fishers’ and the rural people living at the villages around the fish pass. Bangladesh Water Development Board (BWDB), Sariakandi and Sirajgonj Upazila, Bangladesh. DoF, Sariakandi Upazila, Bogra District, Bangladesh. DoF, 2005. Sharonica, Matsha Pokkha. Department of Fisheries, Ministry of Fisheries and Livestock, Government of the Peoples Republic of Bangladesh, Park Avenue, Ramna, Dhaka. 152 pp. FAP (Flood Action Plan) 20, 1994. Fisheries and Aquaculture Tangail Compartmentalization Pilot Project (CPP), Draft Report. Professor Dr. Selina Parween, Department of Zoology, University of Rajshahi, Rajshahi-6205, Bangladesh, who help to prepare this feature by her reverend supervision. Visited 1,682 times, 1 visits today | Have any fisheries relevant question? S/He published 1 features. View All.